HÀ NỘI — About 150 agricultural cooperatives in 16 northern provinces took part in a conference on connecting agricultural production to consumption at the modern retail chain Big C.
The event, organised on Tuesday by several departments of the Ministry of Industry and Trade and the Ministry of Agriculture and Rural Development, and Big C, aimed to connect all parties – State management agencies, retailers and cooperatives – to discuss policies and mechanisms on agricultural cooperatives, product consumption links, and consumption trends in modern retail chains like Big C Vietnam. 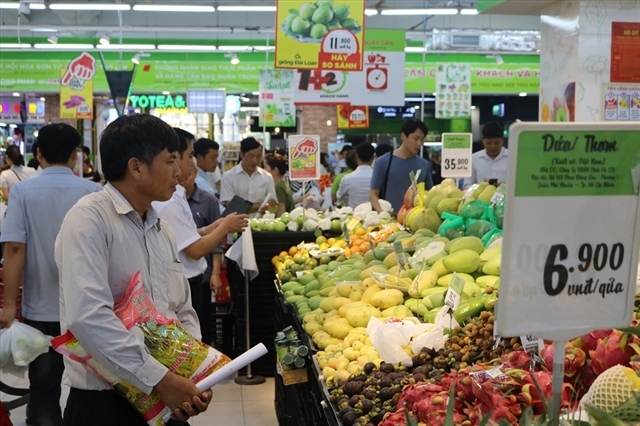 Trần Thành Nam, Deputy Minister of Agriculture and Rural Development, said that cooperatives and enterprises played an important role in connecting farmers and households to retail chains like Big C, promoting production-consumption links for agricultural products. A representative of Big C Vietnam said the company had seen substantial changes in consumption trends in their outlets. Consumers are now giving preference to products with clear origin, labels and packaging, particularly domestic ones, that meet domestic and international standards. Last year, Big C organised many weekly programmes to promote local agricultural products, including the Nghệ An chayote, Cao Phong oranges and Hải Dương carrots. These products saw high consumption, with sales of up to hundreds of tonnes per programme. “Customers feel confident about buying these agricultural products because they have clear origins,” a Big C representative said, adding that customers can now use their mobile phones to scan the origin stamp to view information about the products. At the conference, Big C and 40 cooperatives signed contracts to place goods at Big C’s outlets. Nam asked the Department of Economic Co-operation and Rural Development to summarise the results within three to six months after the conference. The department in collaboration with the Agricultural Extension Centre would then develop a scheme to reproduce this model to gradually increase production-consumption linkages.